Chinese President Xi Jinping is also currently in the French capital, holding trade talks. 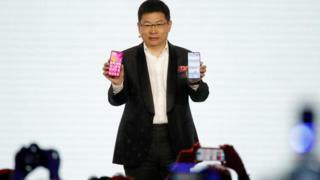 "Like rival smartphone makers, the company faces a tough challenge to convince people that there is enough differentiation in the new devices to justify upgrading, particularly given their premium price tags," Mr Wood said. "It's an interesting move by Huawei and essentially provides glasses or sunglasses that are an alternative to ear buds," said Mr Wood.